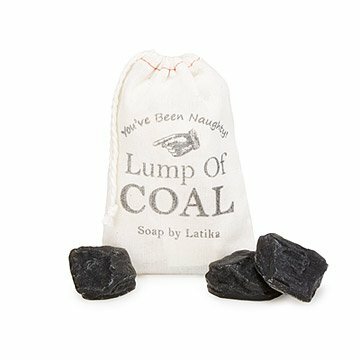 These cheeky little lumps of "coal" are cleverly disguised charcoal soap. Here's a good excuse to land on the "naughty" list. These cheeky little lumps of "coal" are cleverly disguised soap made with organic activated charcoal. They moisturize as they clean and feature a delightfully smoky aroma reminiscent of crackling firewood. Presented in a canvas bag, this cute holiday gift makes a great stocking stuffer for naughty and nice alike. Handmade by Mazzi and Erez Peled in Texas. glycerin, aqua, sodium stearate (from stearic acid), sodium oleate (fatty acid), sorbitol, sodium laurate, sodium myristate, sodium chloride (salt), stearic acid (saturated fatty acid), lauric acid (saturated fatty acid), pentasodium pentetate, tetrasodium etidronate, phthalate free fragrance, organic activated bamboo charcoal.